Glenavon's Kevin Braniff'and Coleraine's Darren McCauley 'during Saturday's match at Mourneview Park. 'Photo by TONY HENDRON/Presseye.com. Gary Hamilton watched on from the stands as his Glenavon side picked up all three points against Coleraine at Mourneview Park. The Lurgan Blues boss, who started a six-game touchline ban today, would have been impressed by his players, the only criticism would be they didn’t win by a more comfortable margin. In the end Rhys Marshall’s header two minutes into the second half was enough to give the home side all three points. 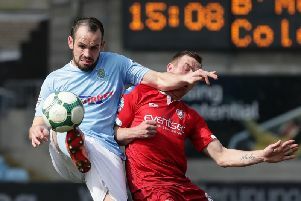 Oran Kearney made six changes to his side with Tuesday night’s League Cup semi final looming large with Michael Doherty and Mark Edgar came in for their first starts of the season, and it led to a largely disjointed performance from the visitors. They had Lyndon Kane to thank for stopping them conceding after only 50 seconds. The right back managed to deflect Kevin Braniff’s goal-bound effort over the bar after Andy Hall had picked him out with the cross. Braniff went close again on 12 minutes after linking up with Eoin Bradley, this time his effort from outside the box cleared the crossbar. At the other other the Bannsiders were denied by a superb reaction save by Johnny Tuffey on 18 minutes. Neil McCafferty’s whipped free kick was missed by everyone, and looked destined for the net, but for Tuffey’s last-gasp intervention. The lurgan blues did have the ball in the net minutes later, it was chalked off though for a foul on Michael Doherty as he came to collect Hall’s corner. The wide man was causing the visitors all sorts of problems, his clever through ball on 24 minutes looked to have laid on a certain goal for Joel Cooper, but he somehow fired wide of the target. The pair combined again just before the break, this time Cooper hit the target but he was foiled by an excellent point blank save from Doherty. The keeper was caught out two minutes after the restart though as Cooper’s inswinging corner was headed in by Marshall. He almost repeated the feat on 50 minutes, but his headed effort crashed off the woodwork this time. Marshall spurned another opportunity on 72 minutes as he glanced Hall’s free kick past the far post. The Bannsiders almost drew level on 77 minutes as McLaughlin got on the end of Jamie McGonigle’s cross, but Tuffey parried the powerful header away from danger. Right at the death McLaughlin wasted anotehr opportunity as he screwed a shot wide on the stretch.